Tax-Free Savings Accounts (TFSAs) and Registered Retirement Savings Plans (RRSPs) are great ways to let your investments grow tax-free — with the added benefit of making your paperwork simpler because you won’t have to track or report the gains of individual investments within them. Deciding which is best for you can be a bit complicated, so this decision tool should help you quickly figure out which to use, with some additional discussion below. Click here or on the preview image to open the PDF. 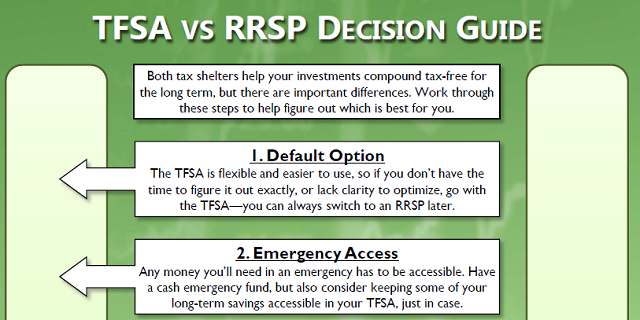 TFSA: The TFSA is a very flexible tax shelter, and also very straightforward. Everyone over 18 gets the same amount of contribution room each year. You put in money that you’ve already paid income tax on (“after-tax contributions”), your investments grow tax-free, and there’s no tax paid on withdrawals. What really makes the TFSA flexible though is that you can add back any withdrawals you make to your next year’s contribution room, so if you find you need access to your funds it’s easy to get at them and then catch up on your savings and get back on track later. 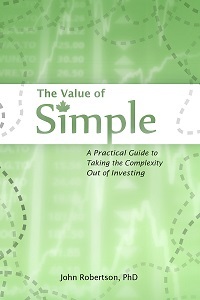 RRSP: The RRSP is a bit more complicated. It also shelters your investments from tax as they grow, but starts with pre-tax money (you get a deduction for contributions), with the withdrawals eventually added to your taxable income. If your tax rates when you contribute and withdraw are the same, the benefit is the same as that of a TFSA, and if you can withdraw at a lower effective tax rate than when you contribute, the RRSP can provide a bonus benefit on top of the tax-free compounding — but predicting if those tax rates will be different (and whether that will be beneficial to you) can be a bit tricky. Everyone has their own RRSP contribution amount, based on how much was made in the previous year along with adjustments for participating in pension plans. While we tend to think of the RRSP as an account strictly for retirement, there are programs for making withdrawals (loans) from your RRSP to buy a house or go back to school (the Home Buyer’s Plan [HBP] and Lifelong Learning Plan [LLP]). You can also make a withdrawal at any time for any reason, but will have to add that amount to your taxable income — and you won’t get the contribution room back. Both: Both can hold a wide variety of investments, from savings accounts and GICs to mutual funds to stocks and exchange-traded funds. Both shelter your investments from taxes (and the associated reporting/tracking requirements). In all cases, if you have the room holding your investments in a TFSA will be better than non-registered (taxable) account. In most cases an RRSP will also be better than a taxable account, but when the taxes at withdrawal will be much higher than those at contribution (high enough to outweigh the benefit tax-free compounding), a non-registered account may be preferable. For example, if you expect to withdraw from an RRSP in retirement where it will cause GIS claw-backs, you may be better off with a non-registered account if your TFSA is full. Likewise, if you’ll need near-term access to your funds, a non-registered account or TFSA may be better than an RRSP. If you don’t have money to contribute now, both the RRSP and TFSA let you carry your contribution room forward until you can use it. The TFSA is flexible and easier to use, so if you don’t have the time to figure it out exactly, or lack some information on your current and future tax situation to optimize, go with the TFSA — you can always withdraw from your TFSA and switch to an RRSP later. The is also a good default option because the TFSA tends to be better for people with less money, but those in situations where they might prefer the RRSP (through the other steps below) will often have enough more than enough money to max out the TFSA, so starting with the TFSA will still lead to having investments in both. Any money you’ll need in an emergency has to be accessible. Have a cash emergency fund, and if you fill your TFSA keep that emergency fund in a non-registered (regular) savings account. But also consider keeping some of your long-term savings accessible in your TFSA, just in case you need more than your cash emergency fund. If you have to sell and withdraw some investments, there will be a lot fewer complications and you’ll get the room back if they’re in a TFSA. If everything is locked up in an RRSP it can add more stress to an already-stressful situation. So if you’re just starting out with your long-term savings, it can make sense to start in the TFSA regardless of other considerations just in case your planning for the long term was off or something unexpected comes up. Always take free money when offered. If your employer matches your RRSP contributions, sign up for that program, as that benefit will almost certainly outweigh any other advantage a TFSA might hold. In some cases this may also point you towards making RESP contributions a priority, but that’s getting beyond the scope of this guide. RRSPs can only beat TFSAs if you’re making RRSP contributions pre-tax. That means that you’re contributing the refund too, or having your contributions come straight off your paycheque with the tax withheld reduced — either way, you have to put more in the RRSP in the first place for it to equal out. Though more dollars go in, because it’s pre-tax it has the same effect on your after-tax spending dollars. If you would contribute the same amount you’ve saved up at the end of the year in either case and then fritter away your refund in the spring, go straight to the TFSA. However, behaviour can also point you in the other direction: if you need your funds to be as locked up as possible to protect you from yourself in a weak moment, you may prefer the RRSP over the TFSA. If you’re lower income (less than about $40k/yr — in the lowest tax bracket), then look towards the TFSA. In particular if you may be eligible for GIS in retirement, the claw-backs from RRSP withdrawals will be a big disadvantage, and the TFSA will be better for you. Remember that claw-backs of these programs is part of your overall effective tax rate to consider when looking at the RRSP’s tax arbitrage ability. Buying a house? The RRSP HBP lets you use pre-tax money for your down-payment, which cam help you avoid CMHC fees. If you already have more than enough saved up to put 20+% down no matter which tax shelter you use, then you may not care, and may even prefer the flexibility of the TFSA. But if you’re just under that mark, being able to put pre-tax money (i.e. your savings plus a refund) in an RRSP and then withdraw all of that (including the government’s portion) can help get you over the line and save a lot on CMHC fees. Another special situation that might favour the RRSP is a gap in earnings, such as going back to school or an upcoming mat/pat leave. Having significantly lower earnings in a year may let you use tax arbitrage early, though you won’t get the contribution room back. Keep in mind that your taxable income is calculated by calendar year, so a leave starting or ending partway through the year may not bring your earnings down far enough for this move to be advantageous. Most comparisons skip straight to this step, but it’s important to understand that the above factors can be more important than the math. However if there are no over-riding factors influencing the decision, then the RRSP will be better than a TFSA for people who have a lower effective tax rate when withdrawing (usually that’s in retirement) than in their contribution years. The TFSA will be better in the opposite case, where the tax rate is lower in the contribution years. Note that the withdrawals may move you up through several tax brackets if a large part of your retirement earnings come from your RRSP, so the average benefit may be there even if the last few marginal dollars are in the same brackets. Don’t forget the effect of clawbacks on government benefits (like GIS and OAS). Predicting your future tax rates (and how they compare to where you’re at now) can be a tough exercise given all the uncertainties of the future (not only your own earnings situation and the performance of your investments, but changes to the tax rates themselves by future governments), so this may be one to work through with the help of your planner. Many people will end up using both accounts to an extent. I’d like to thank Sandi, Dan, and Wayfare for feedback on early versions of the tool. Hey! Could you add a section about what to do if you have a DB pension? I think the answer is fill TFSA first, then whatever RRSP room you have, then non-reg, but would appreciate any other advice you have. I’m not sure what to do when it comes time to draw down my RRSP but I was thinking of deferring taking my pension (increasing my payout) and burning the RRSP money for a few years in the meantime. Hi Stevo, a DB pension comes down to just being a factor in that last step (granted, a bit of a complicated one): you’re going to have a higher baseline of future earnings and associated tax rate from the DB pension (plus less RRSP contribution room), which is going to nudge you closer to prioritizing your TFSA. Then as you say, after that’s full you’ll move on down the line. All good questions. Yeah, I might have to pay someone to figure this out for me eventually. Thanks for the reply. While I have your attention, does it make sense to pretend I have ~30% less in my RRSP to account for taxes that I will eventually have to pay (compared to the stuff that’s in my TFSA), when doing my rebalancing? Since a large chunk of my RRSP room will be eaten by the Pension Adjustment starting in 2016, I think/hope in 25-30 years my TFSA will be a lot larger. That is an interesting question and a long-standing debate that I don’t have a definitive answer to. In terms of how much you have to spend and your plan, yes, absolutely pretend that you have ~30% less in your RRSP (part of it is “the government’s portion” so not all of the money in there is yours to spend). But should you adjust your allocations based on that? On the one hand, yes: you’ve got to pay the tax man eventually, and so the government’s portion should mirror your own. And then the returns on your portion and the government’s portion will be exactly in-line. On the other hand, no: that’s just a fallacy of artificially categorizing things. Yes, the government has to get paid, but it doesn’t have to get paid from the funds in your RRSP — money can flow between the buckets once it’s all out — so you don’t have to try to adjust your allocations for that. In the end I’m not sure it matters terribly much either way. If your RRSP is huge relative to your other pockets of investments then it’s likely already split between a few asset classes. If it’s not, then ~30% one way or another on one class or another (or part of one class or another) is likely not going to blow your portfolio up or be worth worrying about. 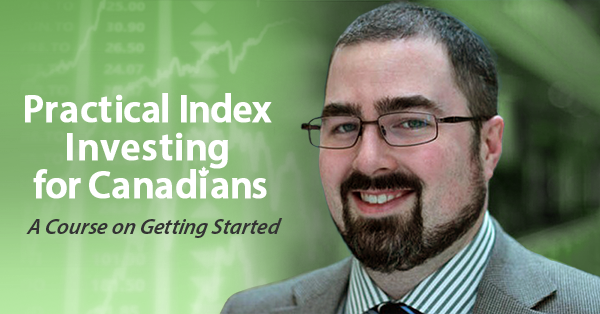 And of course if you’re in e-series or Canadian-domiciled ETFs then you can just have the same asset allocation across all accounts and sidestep the issue. It’s been a while since I’ve seen this debate come up so I’ll see if I can goad some people into taking on each side. Thanks! I hadn’t thought of it that way. Blessed by the Potato is proudly powered by WordPress ♦ Entries (RSS) and Comments (RSS). ♦ 23 queries. 0.394 seconds.